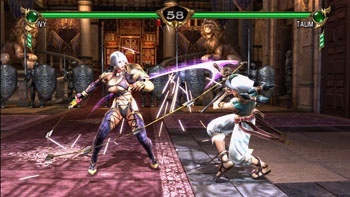 Last week, against my better judgment, I picked up a new copy of Soulcalibur IV. It's the first fighting game I've ever purchased. In fact, I've avoided fighting games since high school, when I began suffering ignominious arcade Street Fighter II defeats at the hands of kids nearly half my age. My prized hadoukens and hurricane kicks were worthless against their expert reflexes, honed by endless hours at the mall. It was more than a relative lack of skill that put me off fighting games, though. As far as I was concerned, they were boring. The repetitive one-on-one combat couldn't hold my interest long enough to inspire me to learn the combos I would have needed to compete. This didn't keep me from occasionally renting, borrowing, or demoing fighting games from the genre's major franchises, mostly out of curiosity. Tekken, Dead or Alive, Soulcalibur, Virtua Fighter and Mortal Kombat releases all found their way into my gaming schedule occasionally. But I was usually bored, frustrated, or both well within an hour. For all the visual whiz-bangery employed with each new release, they still looked and played little different than the arcade games of my youth. Only worse. The combo notations were more cryptic, the stories were terrible, and the characters were ludicrously inane or oversexed. I couldn't stay interested. Why, then, the Soulcalibur IV purchase? It was, I admit an impulse buy, driven in part by the numerous podcasts and online articles extolling the game's virtues. And, judging form the videos I'd seen, it looked incredible in motion. The fact that I hadn't purchased a new console game in months didn't hurt, either. More importantly, I had a nagging suspicion that I hadn't been giving fighting games a fair shake. It'd been all too easy to simply to return rentals or delete demos during past test drives. Sixty bucks, though, was a commitment. I figured it might just keep me hanging on long enough to at least see what all the fuss was about. First impressions were not especially favorable. Yes, the game looked graphically lovely, but from my uninitiated perspective, the control notations were a nightmare. In terms of difficulty, it seemed unforgiving. The story was borderline nonsensical and the characters were often just plain ridiculous, with the barely-clad Ivy in particular standing out as the poster child for embarrassingly juvenile fighter design. Everything I disliked about the genre was right up front. But I did stick with it. The sixty-dollar investment price helped early on. Soon enough, though, I found a deeper reward - I was getting better. The hits that used to ring me out or K.O. me no longer seemed like cheap AI moves. I started to see what I was doing wrong, and slowly, painstakingly, correct my approach. I started improving, and it felt really good.